My first 26.2 mile race was the Kentucky Derby Festival Marathon in Louisville. And it was in the rain. Despite the weather, I loved the experience. I awoke at 4:30 a.m. after about three hours of sleep. My heart was racing already. I made myself two packets of oatmeal and forced myself to eat. I also ate part of a banana and half a bagel with peanut butter. The anxiety made chewing difficult. I put on shorts and a long-sleeve top, but after a few minutes I changed into running tights. I wasn’t sure whether to wear them because they are a bit tight on me, but I needed to wear something with a pocket for my energy gels. Tights it was. I also wore my tags from Perfectley Peared that say “Never Give Up” and “26.2 on 4.25.15.” My race packet included a white Asics cap, which came in handy. It occurred to me on the drive to Louisville that I would need a hat, but I hadn’t packed one. The cap was a lifesaver. I made my way to Corral D just before 7:30 a.m. I could not believe the time had come. As I approached the 4:45 pacer, I saw one of Graham’s good friends. I felt comforted seeing a familiar face among the crowd. On my right was a woman who told me it was also her first marathon. She and I bonded over that for a few minutes before it was time to start walking toward the start line. I waved to Graham as I walked by, put my earbuds in and turned on my running app. The first few miles of the marathon breezed by. The rain was a mist that kept me cool. I was grateful for the cap, which blocked the rain from getting into my eyes. We passed a line of 20-somethings with signs that said, “If you’re still running, we’re still drinking.” We high-fived them as we passed. The Central High School drum line provided a beat for us to run to. All along the route, residents waited outside their homes waving and cheering us on. Some had cowbells, drums, triangles, or stereos blasting music for us. Near UofL we ran under a bridge, at which point a group of racers chanted “C-A-R-D-S.” I noticed a runner with a Ragnar shirt on and wanted to say hello, but it didn’t seem like the right time. Before the race, I read a funny post about what happens when you run a marathon. It said you get emotional about things that actually aren’t sad. When people encouraged me and yelled out “You’re doing great,” that exact thing happened. I felt tears welling up about five times during the race, for various reasons. In the first part of the race, I saw Graham and our family watching on the left. That was one of those emotional moments. 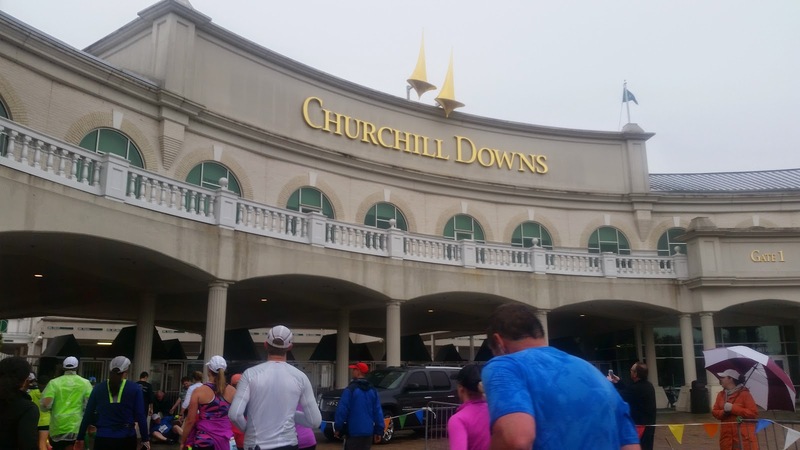 The route took us to Churchill Downs around Mile 8. Running through asphalt on the infield was a highlight of the race for me. 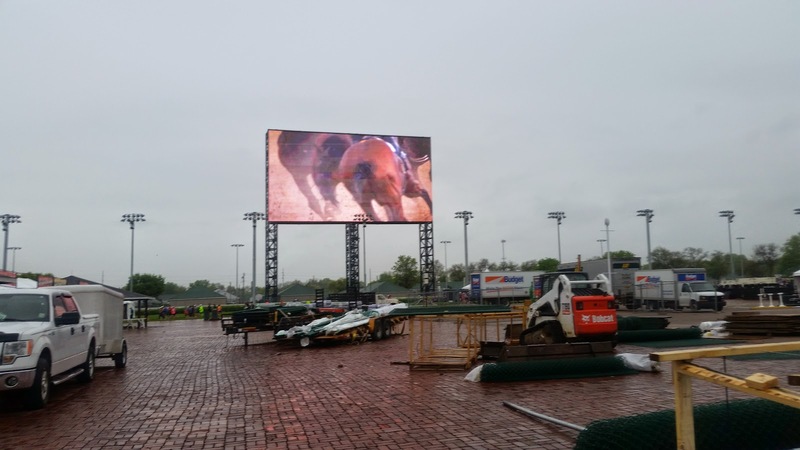 A digital sign said “Go Baby Go” and we could see the racetrack being prepped for the Derby. I knew what was coming after Churchill Downs. We were headed to Iroquois Park, where we had to climb the dreaded hills. The rain intensified as we approached the park. The 4:45 pace group passed me on the first climb. I decided to try to keep up with them, but my app told me after one mile that the pace was 9:15, which was much to fast for me. I decided there to just try to finish between the 4:45 and 5:00 pacers. The park was gorgeous, yet brutal. The scenery at least distracted me from what was happening with my quads. I was relieved to descend from the park back to the surface streets heading toward downtown Louisville. I took another energy packet and keep trekking along. As I neared Mile 19, I noticed my running app was a mile off. I thought I was a mile farther along than I actually was. This was discouraging. I stopped to walk through the water stations from then on and to do some forward bends. For about half a mile, I ran behind the writer behind the Kentucky Gent blog. I considered catching up to him to say hello, but I didn’t want to disturb him. He stopped to stretch and I passed him, missing another opportunity to introduce myself. I took my one bathroom break near Mile 19 or 20. I stopped mostly to give my legs a break, not because I needed to use the restroom. This is when I hit mental roadblocks. I felt discouraged that I was running slower than I wanted and that the rain would not let up. I took more energy gels for a boost. We approached a smaller incline that I walked. At the top, I started chanting “I can do it, I can do it, I can do it. …” in my head. As we turned right near Mile 21, I felt better. It’s funny how when the rain intensified it actually helped me keep going. The last 5 miles were the hardest. My shoulders were tight, I felt pain in my lower back and I was cold and wet. I turned a corner around Mile 24 to step in a deep puddle with my right foot. I felt my socks soak up the frigid water. I started to walk a little more. When I ran, I was just shuffling my feet. I turned onto Brook Street around Mile 25. The 5:00 pacers passed and me and I thought, “No! I can’t let them beat me!” Somehow I found the energy to pick up speed, thinking, it’s only about a mile longer. It was the longest 1.2 miles of my life. We approached the turn toward the finish, where I saw my in-laws. Hearing them say “You did it!” gave me the boost I needed. I looked to my right to see Graham and his brother and sister-in-law. Yes! Finally. I ran through the finish line to collect my medal. My sweet, sweet medal. I was overwhelmed with pride and gratitude. Thank you to my husband for doing all the driving to and from Louisville, for waking up at 4:30 a.m. to help me get ready and cheering me on. Thanks to all my friends and family who sent me encouraging messages before, during and after the race. Thanks to my Louisville family and Graham’s friends for coming out to dinner and drinks to celebrate.